I find that I've had an easier time proposing taxonomic structures for clients' projects than my own. I don't have questions about notebooks vs tags. I understand the difference. I am confused on the best strategy based on my needs. I am an adjunct professor who teaches a range of courses periodically. As such I engage in research and notes for these different courses. Let's say it's about three different subjects. In addition to teaching I work independently and need to do planning and take notes for different clients I have at different times. I provide design and web development services for these clients. At this point I'm dealing with overlapping subjects each other their own niche and specific details. However there is overlap with these subjects. I teach a painting course that deals with the fundamentals of color and visual concepts. It overlaps with a programming course that teaches the same concepts. I will engage in research regarding color theory that connects to both subjects. In situations like this, flat structured tags are useful because they can describe content that falls under digital painting or a specific programming course. The problem I have is that I don't want to continue having tons of flat-structured tags because then eventually I have so many loose tags describing lots of content. I need fewer tags that are more inclusive. If I want fewer tags that describe MORE content then it means I need to plan my tags and reuse them effectively. I teach digital painting (arts and science), electronics (science), web development (art and science), and creative coding (art and science). These subjects overlap in varying ways. This means I should not create hierarchical tags--they should remain flat. Anyway, I don't know how to create meaningful tags that describe content usefully especially since my areas of subject are greatly overlapping. I either end up with tags that describe one or two items or I end up with tags that could define 200+ items. So I don't expect anyone to offer advice on the nature of my research areas but I'm wondering if anyone else has struggled to solve this problem and if they did finally solve it. >>Do you have notes that contain "What" and "When" tags at the same time? I know I can create hierarchical tags but it's difficult deciding on the sub-tags when I'm dealing with overlapping subjects. I don't want a "color-theory" sub-tag that exists under two different tags. What I'm realizing is that I need around two or four large hierarchical tags that function as buckets. These buckets can then maybe overlap like a Venn diagram. Are you doing that with your prefixed tags? Do you have notes that contain "What" and "When" tags at the same time? Maybe those are your buckets. Prefixing is definitely critical. Loose flat tags keep holding back my organization. I've been around for quite a while and amassed a paper library some years ago that occupied quite an area. That's since been concentrated down to my hard drive - some information was discarded because I was confident that I could find more up to date information if and when I needed it, but the general principle was "if in doubt: scan". The scanned material has also been added to in the years since by clips and new documents, so my database is pretty large. I found the most important (in terms of 'could I find it again?') aspect of my data was: what's the material date of the clipping? Not when I scanned the paper, or created the note; but when did this happen. It was also useful to me to know what the documents was - a letter, a receipt, a web clipping...and on top of that who was the author and what keywords did the piece inspire. So I applied a title to each document. The date + type + source/author + keywords. And now I rely on Evernote's search grammar to help me find material based on an intitle:<term> search. There's an ongoing degree of curation here, because if I'm searching for a specific project I'll start adding tags with that project name so I know what I already found. I may also add to or alter the titles of notes I see because in hindsight they're not as accurate as they might be. Sounds a little disorganised, but it works for me. Good luck with your search! Well, it duplicates some effort right? I have this one small business project where I organize music tutorials and I find that it's easy to separate content into a few big buckets: music theory subject matter and technology including agnostic (no specific tech). So you could have two tutorials. One is instructions on making hip hop beats using X software. The other is a tutorial on playing real drums with no specific technology. Both tutorials would fall under the music theory category of "rhythm theory" and one would be within "X technology/software". So it's a Venn diagram. This would eliminate duplicating tags/categories. I'm leaning in this direction but it's difficult figuring out these buckets with all my areas of research. However maybe I'll find that it isn't doable and I'll need to duplicate tags like you did, as well. I think sometimes I find some subject matters seem similar but are separate. 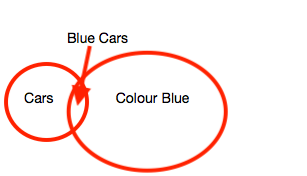 You can use a search tag:Cars tag:"Colour-Blue"
I still need to study the search functionality. Yeah. I guess I would think in vertical and cross sectional terms. Reading the above there could be tags for verticals like Courses, Course type (painting, programming, ...), Content (color theory, visual concepts...), some work related (Clients, Project Types, ...). Then compound tag searches would help find things, for example, tag:Painting tag:Color.Theory would retrieve all notes re painting and color theory no matter the specific class or client. FWIW. Let me offer you another approach about structuring your information in Evernote. I'll use the example you gave about the fundamentals of color and visual concepts and your use this information in your painting course, your programming course, and in your research on color theory. Create 4 notes in Evernote: "Fundamentals of Color and Visual Concepts", "Painting Course", "Programming Course" and "Color Theory Research". Copy the "Note Link" (an Evernote function in the Windows and Mac versions) of the "Fundamentals of Color and Visual Concepts" note. Then, paste the link into each of the other 3 Notes. That way, when you are working on painting, programming, or doing research, you can easily find / refer to your fundamentals of color and visual concepts by merely clicking on the link. This approach is tag-less and I think any Notebook structure would be OK. Think this approach through, give it a test drive, and see if that helps you.